In Celebration!! Get all 3 books in The Grayson Trilogy for under £3/$3 20 – 26 Nov!! Once upon a time there was a woman who wrote a trilogy and then thought she’d turn her hand to a standalone. Attempting a first draft in three months, deadlines (although self imposed, I know!) flashed past as she failed to meet them. There has been much celebrating with chocolate and wine, even though liberal quantities of each have been easing the passage of the words on most days over the last five months, still they have added an adequate cheer to this mini-milestone, for there is obviously still much to do. However, as an added celebration she immediately whacked Before the Dawn and Thicker than Water onto a Kindle Countdown so both will be 99p/99c from 20- 26 November. 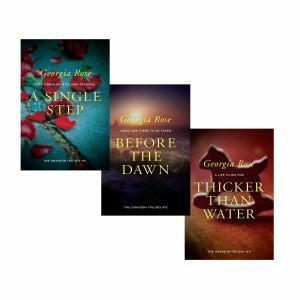 As A Single Step is at this permanently low price that means you can get all three books in the trilogy for under £3/$3. Yay! So anyone out there who doesn’t already have these, and I know there are a couple of you ;-), now is the time to take the plunge. Romance, suspense, action and adventure, these books have it all – it has even been said that this is romance blokes can read, I’ll leave you with that thought. 2 Responses to In Celebration!! Get all 3 books in The Grayson Trilogy for under £3/$3 20 – 26 Nov! !